Qatar Sports Club Doha (D1) strengthened their roster with addition of 24-year old American guard Kevin Bracy-Davis (201-86kg-95, college: Davis & Elkins). 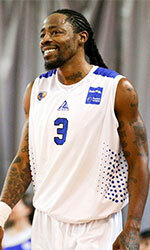 He started the season at Cretan Kings in Greek A1 league. In 14 games he recorded 7.1ppg and 2.4rpg this season. The most of last season Bracy-Davis spent at UU Korihait (Korisliiga) in league where in 19 games he averaged impressive 18.4ppg, 5.6rpg and 1.5apg. He also played for Bierzo Fitness Dentomedic CDP Ponferrada (LEB Silver) in league. In 14 games he had very remarkable stats: 24.0ppg, 6.7rpg and 2.5apg. Good season as he was selected League Player of the Week. Among other achievements Bracy-Davis' team made it to the G-MAC Tournament Semifinals in 2014, 2016 and 2017. He received also All-G-MAC Player of the Year award and All-G-MAC 1st Team award in 2016 and 2017 at his college time. Bracy-Davis attended Davis & Elkins College until 2017 and it is his second season in pro basketball.